Some months back we mention about Rd mute android app which allows you to Mute your android mobile phone with a simple turning over of the phone. And there are so many apps are available in the Android market which will help you to customize your android phone easily. Today here we will discuss about the Shake Screen Off Android App, it an new app in Android market, which allows you to turn off your device’s screen and puts it into sleep mode when you shake it. Yes it simple just shake of the android phone to turn of the screen, so no need to press power button again and again. 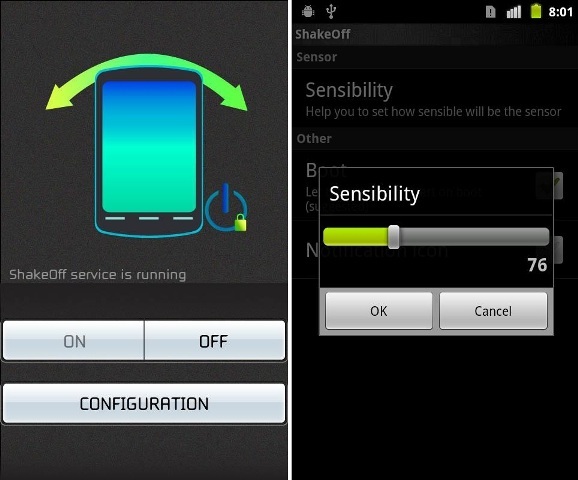 Its simple to use, just install it in your mobile phone, after that you can adjust the sensitivity according to your choice, There are some other options like enable and disable ShakeOff app on restarting, also there is choice for display of notification. It is very easy to use to help lock your screen with a simple shake!